United States oil consumption in 2012 will be about 4.7 million barrels a day, or 20%, lower than it would have been, if the pre-2005 trend in oil consumption growth of 1.5% per year had continued. This drop in consumption is no doubt related to a rise in oil prices starting about 2004. Figure 1. 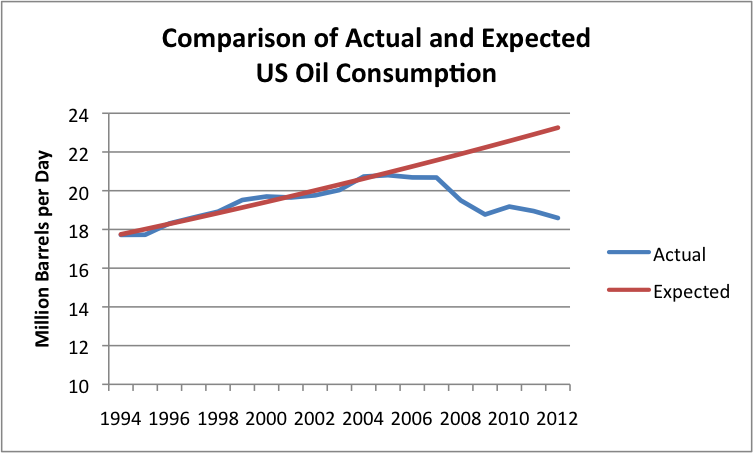 Comparison of Actual US Oil Consumption, with that that would have been expected if prior growth trend held. Actual based on EIA data. 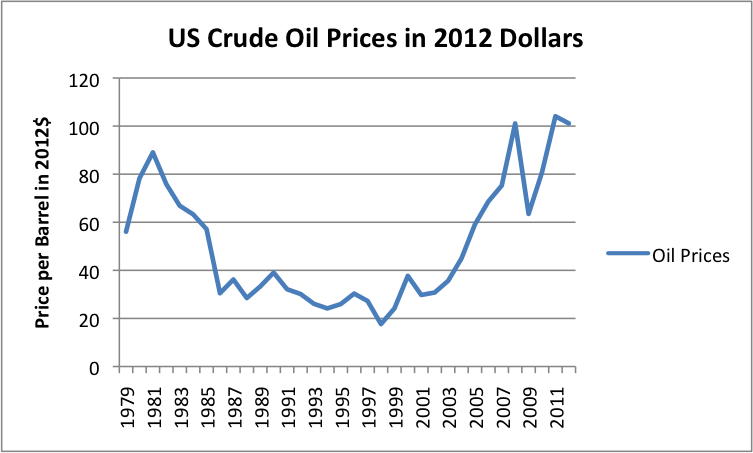 Oil prices started rising rapidly in the 2004-2005 period (Figure 2, below). They reached a peak in 2008, then dipped in 2009. They are now again at a very high level. Figure 2. US crude oil prices (based on average prices paid by US refiners for all grades of oil based on EIA data) converted to 2012$ using CPI-Urban data from the US Bureau of Labor Statistics. Given the timing of the drop off in oil consumption, we would expect that most of the drop off would be the result of “demand destruction” as the result of high oil prices. In this post, we will see more specifically where this decline in consumption occurred. A small part of the decline in oil consumption comes from improved gasoline mileage. 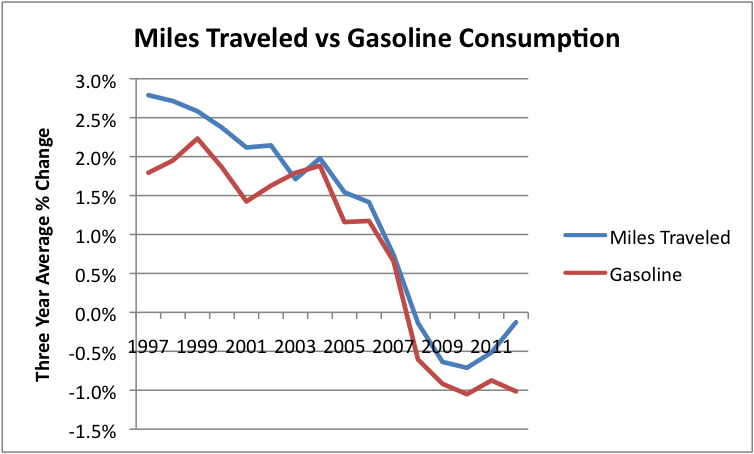 My analysis incidates that about 7% of the reduction in oil use was due to better automobile mileage. The amount of savings related to improved gasoline mileage between 2004 and 2012 brought gasoline consumption down by about 347,000 barrels a day. The annual savings due to mileage improvements would be about one-eighth of this, or 43,000 barrels a day. Apart from improved gasoline mileage, the vast majority of the savings seem to come from (1) continued shrinkage of US industrial activity, (2) a reduction in vehicle miles traveled, and (3) recessionary influences (likely related to high oil prices) on businesses, leading to job layoffs and less fuel use. Figure 3. US Oil Products Consumption, based on EIA data. 2012 is based on partial year data. Of the three product groupings shown, gasoline1 consumption is the flattest. Under “normal” circumstances, we would expect gasoline consumption to continue to rise, along with oil products in general, as shown in Figure 1 at the top of the post. The amount of gasoline consumed reflects at least two different influences (1) the number of miles traveled, and (2) savings due to more fuel efficient cars. Based on data compiled by the US Department of Transportation, vehicle miles traveled (VMT) were rising by 2.2% per year prior to 2004, then suddenly flattened (Figure 4, below) about the time oil prices started to rise significantly. Figure 4. US vehicle miles traveled, actual (based on Department of Transportation data) and expected based on prior trend. 2012 is based on partial year data. The drop in vehicle miles traveled greatly affects gasoline sales. If vehicle miles traveled had continued to rise as quickly as in the early period, we would expect automobile mileage to be 21% higher than my current projection for the full year 2012, and gasoline use would be equivalently higher. How do changes in gasoline sales track with changes in VMT? Figure 5, below, shows that they track fairly closely. 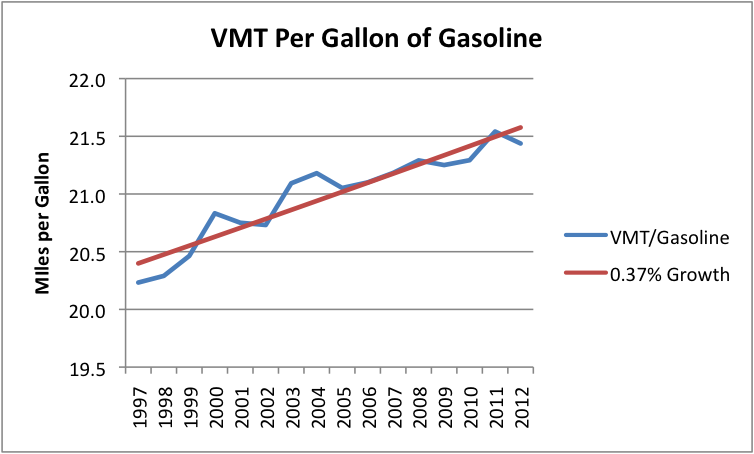 Annual changes in gasoline consumption are a little below changes in VMT (averaging about 0.4% below VMT) . Figure 5. Three year average changes in vehicle miles traveled (based on DOT data) vs changes in gasoline consumption (based on EIA data). It is also possible to calculate implied VMT per gallon of gasoline (Figure 6, below). This is somewhat of an apples to oranges comparison because VMT includes travel by vehicles using fuels other than gasoline (usually diesel, but occasionally natural gas or electricity). As a result, the calculated mileage in Figure 6 is higher than the actual average MPG for gasoline powered vehicles. If the proportion of gasoline powered vehicles in the mix stays fairly constant, the annual percentage change should still be accurate, though. Figure 6. Vehicles miles traveled per gallon of gasoline based on DOT data, with trend line fitted by author. If we apply the 2004 rate of fuel usage (or MPG) to 2012 VMT, we find that the improvement in fuel mileage between 2004 and 2012 reduced fuel usage by 347 thousand barrels a day over the eight year period, which is equivalent to a reduction of about 43 thousand barrels a day, per year. The total reduction in gasoline use between 2004 and 2012, relative to what would have been expected, (based on the trend line in Figure 1, assuming the mix of products each retain their 2004 proportions) is about 1.49 million barrels a day. Thus, this calculation implies that about 23% of gasoline savings is from better mileage; the other 77% is from driving fewer miles. One point of interest is the fact that US population has recently been growing by 1% per year. Because of the growing population, a person would expect VMT to grow by at least 1% per year, unless per capita miles driven is shrinking. 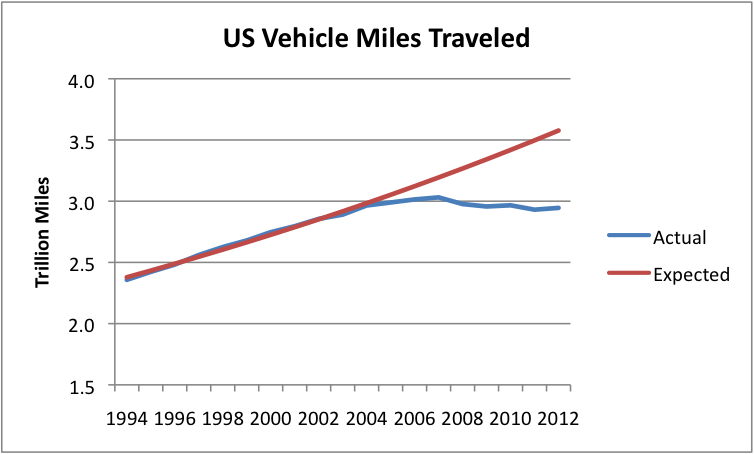 Since 2004, vehicle miles traveled have been growing less rapidly than population growth. As a result, mileage per person has been shrinking, recently by a little over 1% per year. Prior to 2004, vehicle miles traveled were growing at 2.2% a year while population was growing at 1.1% per year, implying that per capita miles traveled were increasing by 1.1% per year. How do vehicle miles per person go from increasing to decreasing? There are a couple of possible ways. One is by a reduction in the number of drivers; the other is by decreasing the number of miles driven for individual drivers. My friends who are automobile insurance actuaries tell me that at least part of the change recently is that fewer young people are driving. This is not too surprising–young people today have very high unemployment rates, so they are less able to afford the cost of a car. Figure 7, below, shows the trend in fuel consumption since 1994 for the same fuels as shown in Figure 3. It is clear from Figure 7 that gasoline and distillate consumption have followed fairly similar patterns. It is the “All Other” category that has shrunk markedly. Figure 7. 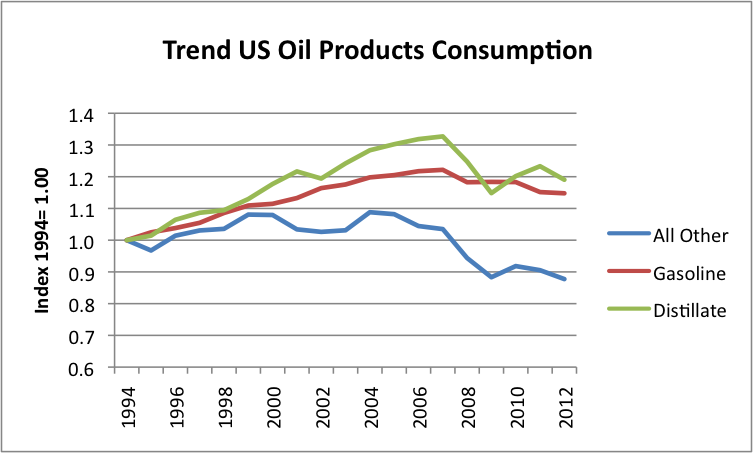 Trend in United States Oil Products Consumption since 1994, based on EIA data. At least part of the reason the “All Other” portion is shrinking is the fact that the All Other category includes quite a bit of oil products for industrial use, and the amount oil products used by the industrial sector shrank by 7.9%, comparing 2011 to 1994. We can also look at the use of other energy products by sector, to see additional evidence that the Industrial Sector is shrinking, or at least, not growing nearly as much as the other sectors are growing. For example, if we look at electricity use by sector, residential use is up by 41% since 1994, commercial use (office and stores) is up by 44% since 1994, while industrial use is down by 3%. Figure 8. 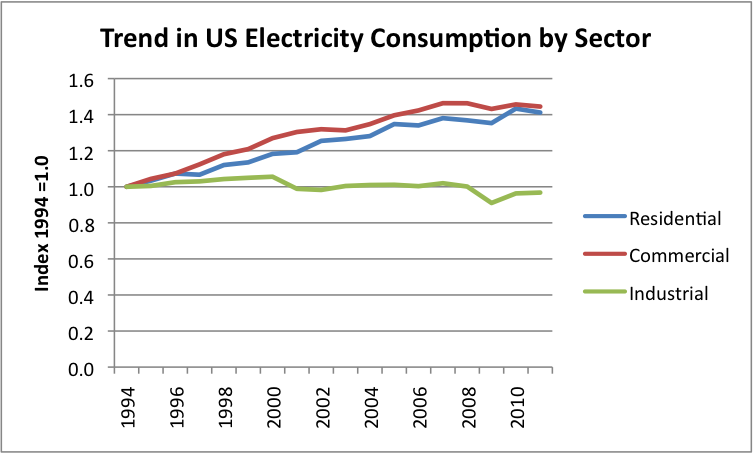 Trend in electricity use since 1994 by sector, based on EIA data. Also, between 1994 and 2011, use of natural gas by the industrial sector declined by 8.5% further suggesting that the industrial sector that is shrinking. One factor in this shrinkage is likely increased competition from China, once they joined the World Trade Organization in December 2001. Of course, part of the reason for the lower growth in oil products use by All Other could be greater industrial efficiency. Industrial users, and users such a big agriculture and aviation, are in a position to see ways to reduce oil use quickly. Such approaches would include “no till” farming (often substituting oil-based herbicides for oil-based tilling) and cutting back on unprofitable airline routes, saving fuel by grounding underutilized jets and laying off workers. Part of the reduction in All Other use, too, could be that at the high oil prices available recently, refiners can make more greater profits by “cracking” and refining the heavy portion of oil, rather than sell it as products such as asphalt or residual fuel oil. Because of this, refiners are making less of the “All Other” products, and more Distillate and Gasoline. Users of heavy products are forced find substitutes, such as diesel or coal or concrete. Another point of interest is the fact that the trend in gasoline and in distillate consumption both roughly follow the trend in the number of jobs available in the US economy. Figure 9. Trend in number of US Jobs versus US gasoline and diesel consumption, based on EIA data. 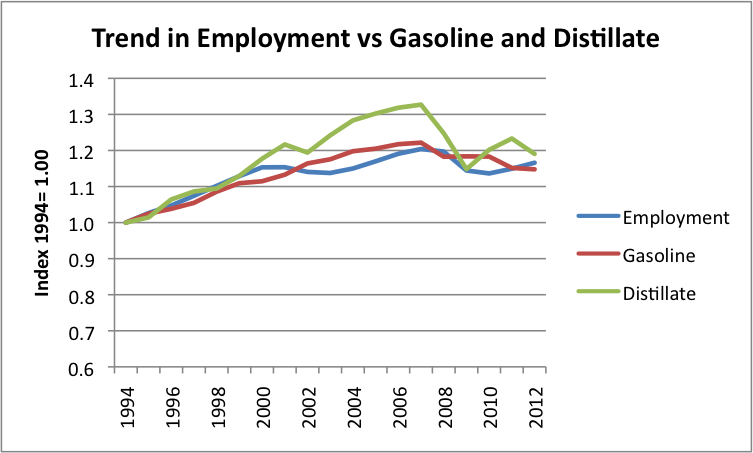 There is a theoretical reason why gasoline consumption might rise and fall with employment. People who have jobs can afford to buy cars and drive them. People who don’t, often can’t afford to drive. Distillate use tends to bounce around more, as if businesses (who tend to use diesel fuel) are more influenced by economic conditions than individual drivers driving gasoline powered cars. The overall trend still seems to follow employment, though. This would seem to suggest that if less fuel is used by vehicles, this is often accompianied by fewer workers–either fewer drivers for trucks, or fewer workers making the goods carried in the trucks. There may be gradual mileage efficiency gains, but in the short run, the big fuel savings come from operational changes that lead to using fewer vehicles and also fewer workers. Figure 10. 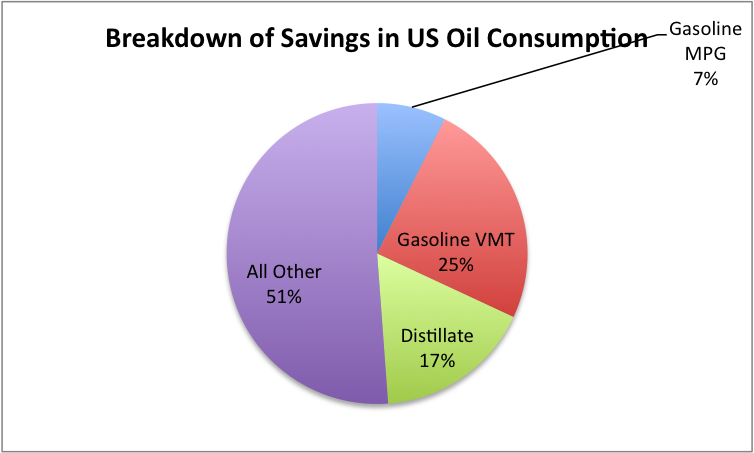 Breakdown of US oil consumption saving, based on author’s calculations. Decreased gasoline usage due to improved gasoline mileage amounts to 7% of the total, decreased gasoline usage because of fewer miles traveled amounts to 25% of the total, and a decrease in distillate use amounts to 17% of the savings. The majority of the decrease, 51%, comes from a decrease in the “All Other” category, which is most closely related to a decrease in industrialization. 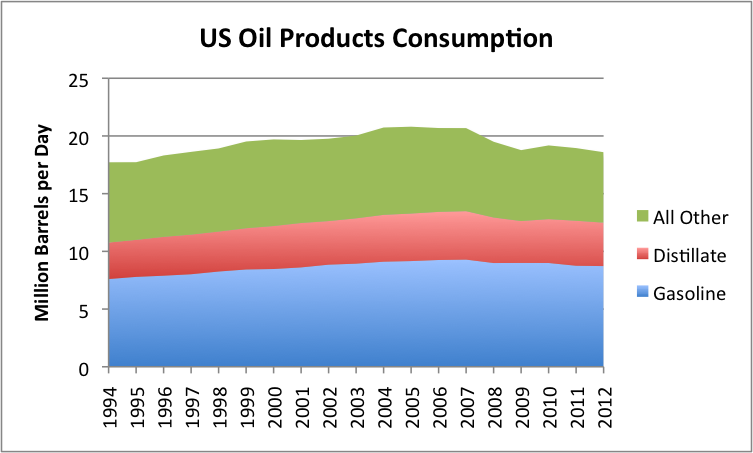 The way the calculation is made is as follows: The trend line forecast of 2012 consumption of oil products shown in Figure 1 is distributed to product based on the product’s share of 2004 US oil consumption. The year 2004 is used as a baseline because it approximately represents the situation before the big rise in oil prices took place. The savings is then the difference between (1) these forecasts of consumption by product and (2) my estimates of 2012 actual consumption by product. The latter estimates should be fairly “solid,” because they are based on actual consumption through October. Going forward, fuel efficiency changes are likely to play a larger role in fuel savings, because CAFE (Corporate Average Fuel Efficiency) Standards have been unchanged for about 20 years. For model years 2012 to 2016, they are again increasing, so auto makers are again making more of an effort to improve mileage. Actual fuel efficiency gains in the next several years for the US fleet of cars will depend partly on the mileage improvements incorporated by manufacturers, and partly on how many of these more efficient (but also more expensive) cars are purchased. I have recently forecast that we will be entering another very-long recession in 2013. The recently announced decline in US GDP in the fourth quarter of 2012 is another indication in this direction. In a recession, it will be difficult to sell as many of the new fuel-efficient vehicles. Another factor that is likely to be important for future actual vehicle mileage is the condition of roads. Mileage estimates are based on having good paved roads. If local governments find their budgets stretched thin, road maintenance may not get proper funding. We may even see more gravel roads, if asphalt is increasingly unavailable, and concrete is too expensive. Gasoline as used in this analysis includes any ethanol that is blended in. This has been an increasing percentage over time, and now is typically 10% by volume. The addition of ethanol tends to keep mileage down because ethanol only gets about two-thirds as many miles per gallon as gasoline. I have not attempted to adjust for this. The mileage gain would be somewhat better, if ethanol had not been added to the gasoline. An increase in the ethanol blend to 15% have been approved. As this is phased in, it will also tend to depress mileage gains. This entry was posted in Financial Implications, Oil Policy and tagged demand destruction, fuel savings, gasoline, gasoline consumption, gasoline savings, industrialization, mileage, miles per gallon, MPG, oil consumption, oil demand destruction, vehicle miles traveled, VMT. Bookmark the permalink. 92 Responses to Why is US Oil Consumption Lower? Better Gasoline Mileage? Pingback: Oil Consumption Analysis: Jobs, Robots, Manufacturing, Gas Mileage Improvement; What’s the Explanation for Declining Oil Consumption? Fewer miles may be driven due to changes in our consumption habits. How many products/goods/services have been purchased by people without needing to leave their homes? Amazon has gotten pretty large over the period. How many trips do people make to Blockbuster to rent movies these days? The examples of this type are probably many. I remember having to do all my “product research” in-person at the mall, Best Buy, etc. I don’t have to waste time driving to various outlets to learn about the latest products anymore. Not sure how to quantify what those miles would add up to, but it definitely is significant, for myself at least, compared to just 10 years ago. We are headed back to the day of the Sears Roebuck catalog. It is more efficient to order things on line, and have a delivery truck stop at our door, than to drive to the mall, try to find a clerk somewhere, and buy with a smaller selection of products. Interesting! There are some large cities where what you say is true in the United States. In general, though, our cities and even our smaller towns are now laid out for cars. This makes it harder to get around without a car. Maybe we will see more smaller grocery stores open up closer to where people live, or more delivery.